Brainstorming 4 Us provides services to those whose lives are affected by brain injury within the state of California. We offer trauma bags to families who have a loved one admitted into the ICU or CCU unit with any form of head injury. Accessible services include patient advocacy, resources; support groups, special social events, educational training for law enforcement, schools, and speaking engagements. Brainstorming 4 Us facilitates our annual “Walk, Run or Roll 4 Thought” each year to educate the public on the consequences of brain injury as well as raising funds to ensure we can provide our services at a reasonable fee. A brain injury is a marathon, not a sprint and with your support, we continue to reach new families every year. You may view the Mind Matter video under the news area of our website or view on our Facebook account. The video is a collaboration of survivors and caregivers living with a Traumatic Brain Injury, Aneurysm or Brain Cancer. Throughout the year, we meet many survivors and caregivers who are thrusted into the long-term effects that follow a catastrophic injury. This year marks our 12th annual “Walk, Run or Roll 4 Thought”, to promote awareness, education, resources, support, and funding for our projects. Making a difference in the lives of the families, is what drives our passion. Consider donating, walking or sponsoring our event and personally touching a survivor’s life. Each year, Brainstorming4Us host our Walk/Run4Thought event. The event raises funds for Brainstorming4Us organization so we can operate our current projects . 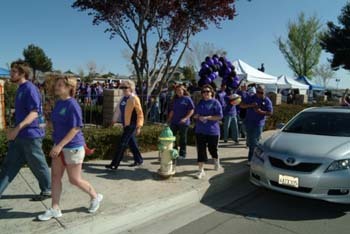 March is Brain Injury Awareness month and we support this by host the Brain Injury Awareness Walk. Visit our Walk4Thought page for more information. Through your participation, you can help us provide support to individuals and families living with brain injury. The Walk4Thought is sponsored by many wonderful friends, organizations and businesses. Please visit our Sponsors and Vendor pages for a complete list. We provide Brain Injury Resource Bags to hospitals and trauma centers for distribution to individuals and families dealing with a loved one hospitalized due to brain injury.